Whether you are an incoming freshman or a senior with his or her eye on the finish line, you know firsthand the stresses that come with being a college student. Maybe you’re learning how to juggle classes, homework and a part-time job. You take deep breaths as you walk through the campus of Sam Houston State University, contemplating how to fit everything into your already jam-packed day. Then you see it. There it is. It’s the brand new College of Humanities and Social Sciences Building. You walk inside only because you like checking out new buildings. Then you find what you didn’t even know you were looking for: the SAM Center, or the Student Advising and Mentoring Center. 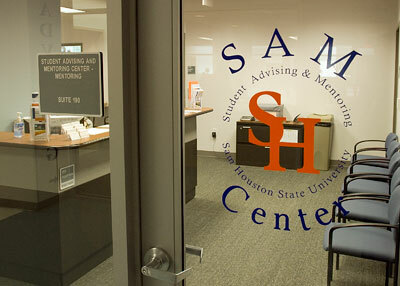 The SAM Center opened its doors in 2001 as an advising center for students. The center is designed to help students plan an academic course load that best suits their needs. In addition, it offers numerous programs to help support academic performance. Strauss said every student at SHSU should take advantage of their services, rather than letting their college career become overwhelming. The SAM Center offers one-on-one mentoring to help students stay focused and achieve their academic goals. There are also group seminars available to teach college students survival skills. One such program is Study Skills, a six-week series made up of six 50-minute sessions, taught by students to help other students understand the core skills needed for academic success. Study Skills addresses concerns such as procrastination, time management, and classroom etiquette. Students pay an advising fee each semester, which covers all of the advising and mentoring services offered at the SAM Center. “First Alert is another valuable service to faculty and students,” said Strauss. “With First Alert, faculty can refer to us a student who is not doing very well, either because of absences or test scores, and the student can come in and meet with us and talk about what they may need. It is sort of an intervention, so they can see a mentor or sign up for Study Skills, or drop a class; whatever they need,” said Strauss. While the classes and programs offered by the SAM Center offer more detailed instruction, Strauss offered three tips to help students survive college. First, she said students must be active problem-solvers. Next Strauss stresses the importance of learning time management. Finally, Strauss said students must learn to start projects early. She added procrastination can lead to failure, and students often see failure as a sign that they lack intelligence, when really they lack study skills. The SAM Center is not the only place students can find assistance at SHSU, but the center takes pride in having answers to questions and being able to point students in the right direction, according to Strauss. The SAM Center also offers support to students who are taking courses online. To sign up for the fall 2010 Study Skills workshop, you can visit the SAM Center, on the first floor of the College of Humanities and Social Services Building, or e-mail the center at sam_asp@shsu.edu. The first series begins Sept. 13, and the sessions are available Monday through Friday at numerous times throughout the day. For information about the other programs provided by the SAM Center, call 936.294.4361.